KOOTENAY PROVIDES DRILLING UPDATE O | Kootenay Silver Inc.
Kootenay Silver Inc. (TSXV: KTN) (the “Company” or “Kootenay”) is pleased to report 6 additional core drill holes have been completed and submitted for assaying, with the core drill rig collared on the 7th hole within the La Soledad Zone, located approximately 1,000 meters south of the Company’s established La Cigarra silver resource in Chihuahua State, Mexico. Drilling on La Soledad is part of a current 3,000 meter, multi-phase discovery and resource expansion program underway to assess and evaluate several high priority targets that have been identified proximal to the La Cigarra deposit with the potential to add near surface silver resources to the project. 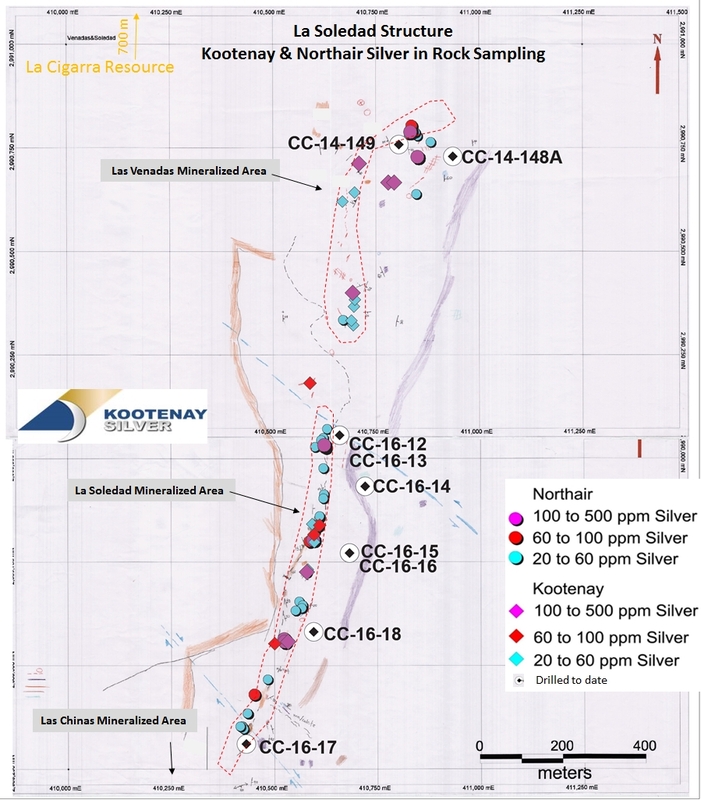 The Company drilled the first 11 holes of the program on La Cigarra’s adjoining RAM structure resulting in an entirely new silver discovery (see news release dated November 23, 2016), within a large structurally controlled anomalous silver trend measuring 3.8 kilometers in length. Combined with the 5 holes drilled on the La Soledad structure, the Company reports it has completed a total of 16 holes to date on the program. The La Soledad structure is contained within the southern extension of the main La Cigarra mineralized system that currently measures over 6.5 kilometers in length and remains open to the north and south. A comprehensive ground exploration and reconnaissance program recently conducted by Kootenay on La Soledad confirmed mineralization along the structure occurs as quartz vein breccias up to 8 meters in width with peripheral veins and stockworks in a 60 to 80 meter wide zone. Previous rock and chip sampling taken by both Northair Silver and Kootenay returned high-grade silver values of 582, 458, 323, 278, 277 gpt. Kootenay’s technical team report the mineralized quartz breccias share similar textural affinities to the major Veta Colorada Mine located to the east of the La Cigarra Property (immediately north of the City of Parral) and to the San Francisco Del Oro and Santa Barbara veins being actively mined immediately south of La Cigarra. 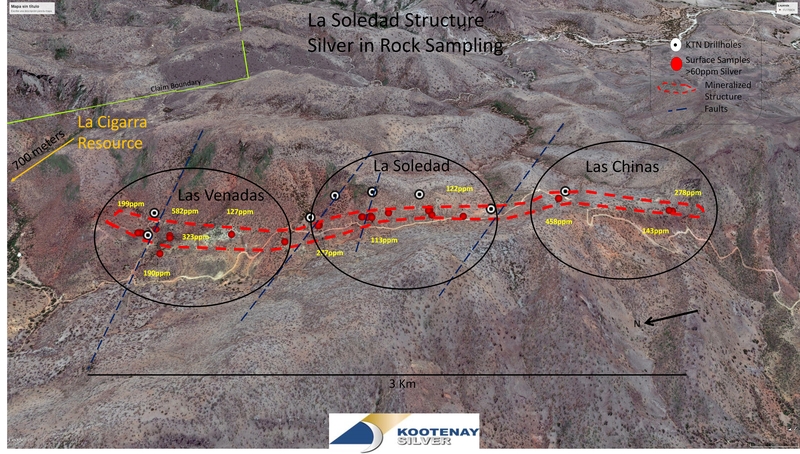 To view maps of the La Soledad Structure highlighting the silver in rock sampling program click on the following links: La Soledad Silver in Rock Sampling Plan; La Soledad Silver in Rock Sampling Image. The Soledad Zone is one of 8 prospective targets that have been identified proximal to the La Cigarra deposit with the potential to add near surface silver resources to the project. In total, the Company completed an additional 1,000 meters in drilling in the 5 diamond drill holes on La Soledad structure. Results from Phase I drilling on the La Soledad will be announced as soon as assays from the program are compiled and interpreted by the Company. The current 16 drill holes are the first phase of a planned ongoing, multi-phase drilling program that will be conducted on the La Cigarra project over the next 12 to 18 months. Follow up drilling of the RAM and the La Soledad structures is expected to commence in the early part of the New Year and will form part of a larger strategy to test additional undrilled targets and the extensions of the La Cigarra Deposit itself. Once the current 3,000 meter drill program is complete and results of re-logging and detailed mapping of the deposit are interpreted, the details and dates of the anticipated follow up programs will be finalized and announced in a future news release. Kootenay Silver Inc. is an exploration company actively engaged in the discovery and development of mineral projects in the Sierra Madre Region of Mexico and in British Columbia, Canada. The Company's top priorities are the advancement of the La Cigarra silver project and the Promontorio Mineral Belt, in Chihuahua, Mexico and Sonora, Mexico, respectively. The La Cigarra property is 26 kilometers from the historic mining city of Parral and boasts nearby power, good road access, gentle topography, and established infrastructure. La Cigarra currently hosts a resource estimate of 18.54 million tonnes containing 51.47 million ounces of silver in the Measured & Indicated categories grading 86.3 gpt silver and 4.45 million tonnes containing 11.46 million ounces of silver in the Inferred category grading 80 gpt silver. The mineralized system at La Cigarra has been traced over 6.5 kilometers and is defined at surface as a silver soil anomaly and by numerous historic mine workings. The La Cigarra silver deposit is open along strike and at depth and is approximately 25 kilometers north, and along strike, of Grupo Mexico's Santa Barbara mine and Minera Frisco's San Francisco del Oro mine. The Promontorio Mineral Belt includes the Company’s La Negra high-grade silver discovery and its Promontorio Silver Resource. The Promontorio Mineral Belt is under option to Pan American Silver whereby they can earn a 75% interest in the project with US$16 million of expenditures and payments with Kootenay retaining a 25% carried to production interest (see news release February 16 and March 4, 2016). The Promontorio Silver Resource currently hosts a resource estimate of 44.5 million tonnes containing 92 million ounces of silver equivalent in the Measured & Indicated categories grading 64.3 gpt silver equivalent and 14.6 million tonnes containing 24.3 million ounces of silver equivalent in the Inferred category grading 52 gpt silver equivalent. The Company's core objective is to create value by acquiring silver resources through discovery and acquisition and testing those resources with the ultimate goal of developing them into silver production if they are proven to be economically viable. The information in this news release has been prepared as at December 7, 2016. Certain statements in this news release, referred to herein as "forward-looking statements", constitute "forward-looking statements" under the provisions of Canadian provincial securities laws. These statements can be identified by the use of words such as "expected", "may", "will" or similar terms.